My friend was building a Stirling engine and when he found out that I owned a small lathe, he asked if I’d machine a piston and cylinder for him. Having some materials on hand like copper tubing for the cylinder and some solid aluminum rod for the piston, I agreed to make the parts. Another one of the parts he needed was a 7/16″ bolt with a hole drilled down the center of it. He had tried to make the hole with his drill press, but ran into a problem where the hole he drilled was not centered. This became apparent only after the hole was finished, of course, as it exited the far end of the bolt off center. 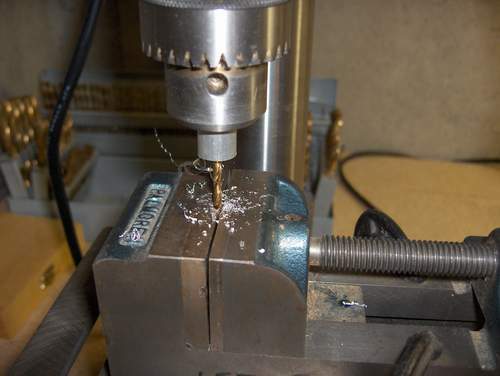 I had an idea about a procedure for drilling an accurate center hole in a cylindrical part with a drill press by first aligning a drill vice to hold a drill bit stationary while using the drill chuck to grip and spin the work piece. My drill’s chuck can hold a drill up to 1/2″ in diameter, which would be more than sufficient to grip a 7/16 bolt on its shank. I thought I’d run a quick experiment and document the procedure for anyone else who may want to try using a drill as a lathe for making a center hole in a cylindrical part. A lathe is most often used to turn a part using a cutter that can either remove material from the diameter or from the part’s face. But it also has a very nice feature when a drill chuck is inserted in the tailstock, and that is to accurately drill a hole precisely down the center of the part. An example of that is shown below. Normally, you would use something called a center drill to start the hole and then swap it out for the drill of the proper diameter. If the hole is large, you may have to drill with several drill sizes to get it up to the finished diameter. In this case, the hole I wanted to make was just .125″ in diameter so it was possible to do with just a single drill in one step. The procedure I describe below would need to be modified by resetting the alignment for each drill if you need to open the hole up in several steps. If you didn’t own a lathe but had a drill press and a drill vice, here is a procedure for drilling a center hole in a cylindrical part. First, you put a drill of the desired diameter in the drill chuck and tighten it. 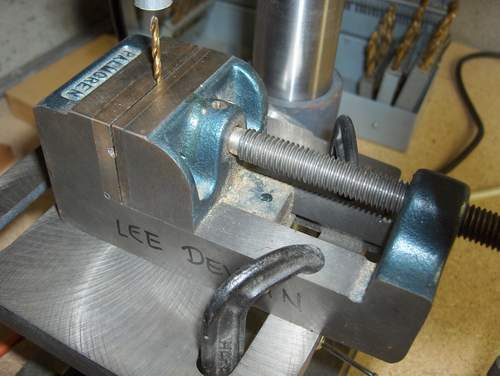 Then gently raise the drill table, clamp the table to set its height, and then and move the drill vise to the bit and clamp the drill vice down on the bit. 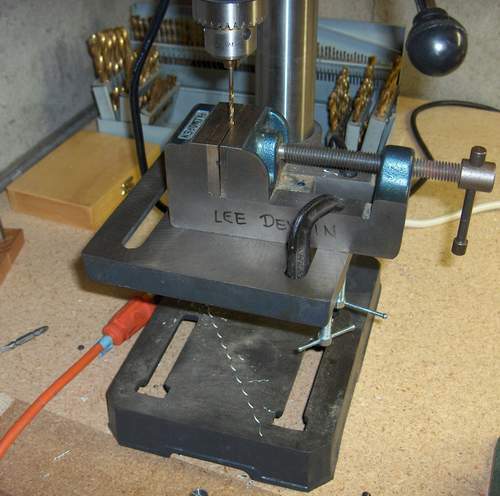 The drill vice must have a ‘V’ groove one its jaws to align it vertically on the drill bit. This is important for a subsequent step. After everything is aligned, then use a pair of ‘C’ clamps to hold the drill vice to the table so it cannot slide from side-to-side. Then un-clamp the drill bit from the chuck and the drill vice and turn the bit upside down and clamp it in the vice’s V-groove again so that its tip is facing upward. Then clamp the workpiece in the drill chuck. In this case, I’m using a .5″ diameter section of aluminum rod as the workpiece. Here the drill is clamped in the vice pointing upward and the workpiece is just partly visible and clamped into the drill’s chuck. Then turn the drill on. 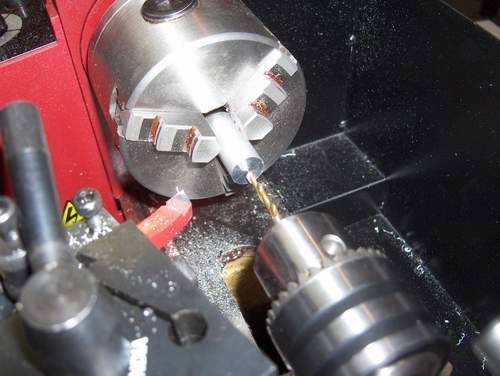 Just like on the lathe, the drill bit will be stationary and you can lower the spindle with workpiece and it will drill the hole accurately through the center of the part. Remember to lift up on the spindle periodically to clear out the metal chips. If you got everything aligned correctly, the drill will make the hole directly in the part’s center. In my case, the hole was within .002″ of being concentric with the outside diameter of the part on both ends of the part. That’s about as accurate as you would get with a lathe so the technique works well. It may not be apparent but the part is spinning, the drill bit is stationary. Here’s the finished part with the hole perfectly centered. This entry was posted in hobbies, household repair, how to, technology by Lee Devlin. Bookmark the permalink. This is amazing. I didn’t know that Drill Press can be used like a lathe to make a center hole. This trick is definitely going to be helpful in my DIY projects. I really liked your post.Thanks for sharing this post and keep sharing more…. HI Lee Devlin! Great article. I was searching this topic from last some days. At last, I got it. Thanks for sharing. Adnan recently posted…Best Wood Lathe Reviews 2018! I discovered this tip (on somebody else’s website) a few years back, and it works exceptionally well. 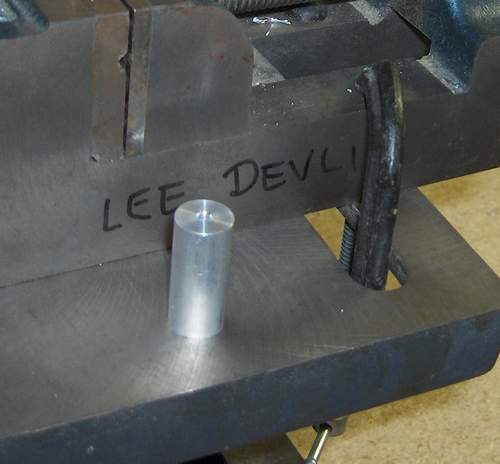 I made a spacer (1/2″ OD 3/8″ ID) that needed to be very concentric as it was going to be holding 3/8″ shank tooling in a 1/2″ hole with set screws. It took 2 tries to get it but the result has no more than a couple thousandths runout, it is imperceptible. To get this I had to have two clamps on the vice and bring the clamps and vise jaw all gradually and evenly up to tension on the drill bit, and gradually tighten all three spots on the chuck. Also the first (failed) attempt I put the bit into the vertical vee groove on the vise jaw, the second time I didn’t use the vee as I think that also made it less accurate.